(CNSNews.com) - President Barack Obama will leave the federal government approximately $9,335,000,000,000 deeper in debt than it was when he took office eight years ago, according to data released today by the U.S. Treasury. The increased debt incurred under Obama equals approximately $75,129 for every person in the United States who had a full-time job in December. 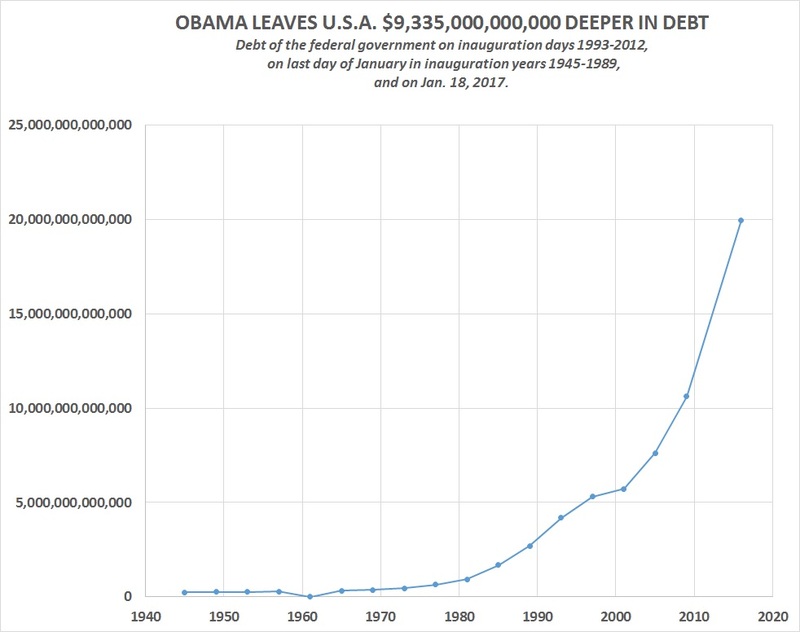 The $9,334,590,089,060.56 that the debt had increased under Obama as of the close of business on Wednesday is far more debt than was accumulated by any previous president. It equals nearly twice as much as the $4,889,100,310,609.44 in additional debt that piled up during the eight years George W. Bush served as president. When Obama took office on Jan. 20, 2009, the federal debt was $10,626,877,048,913.08. As of the close of business Wednesday, it was $19,961,467,137,973.64. The final debt number for Thursday, Obama’s last full day in office, will not be released until after Donald Trump is sworn in as president on Friday. According to the Bureau of Labor Statistics, there were 124,248,000 people in the United States with full-time jobs in December. The total federal debt of $19,961,467,137,973 equals approximately $160,658 for each one of those workers. The $9,334,590,089,060.56 that the debt has increased under Obama equals $75,128.69 for each one of those works.